The plans call for the demolition of the existing 29,000-square-foot city hall and the relocation of a fire station and two historic buildings to elsewhere in the city. The site, according to the city’s request for proposal, could accommodate nearly 1.4 square feet of new building space, and allow for over 950 residential units that could be designed and constructed in phases. The city commission approved the proposal March 12. It was formally advertised to the public on March 15. 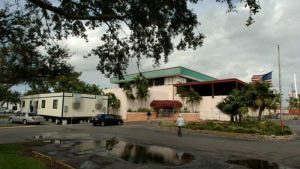 The idea follows the lead of other South Florida cities that are either building new government centers or are contemplating them. 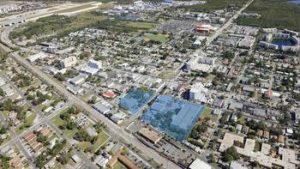 Boynton Beach is moving forward with a project. The City of Fort Lauderdale and Broward County are close to agreeing to build a joint city-county complex downtown. “The site could accommodate 1.4 million square feet of new building space, creating great potential for multiple uses, including retail and apartments,” said Colliers International broker Bradley Arendt, who is helping the city promote the project. The firm says an existing 440-space parking structure could be expanded to 660 spaces by adding two floors. Since 2010, Dania Beach has seen its population grow by 8.1 percent, with millennials as the largest group of new arrivals, according to Colliers International. The city, which is south of Fort Lauderdale-Hollywood International Airport and a few minutes’s drive from major cruise line terminals at Port Everglades, is undergoing a major expansion on its west side with the construction of Dania Pointe, a 102-acre commercial and residential center containing shops, restaurants, movie theaters, hotels and apartment complexes.